The Martin Luther King Jr. holiday is upon us in the U.S. and with it a plethora of commemorative items and events for the work the famed Civil Rights leader accomplished in his lifetime. As a social justice advocate, woman, person of color, and a believer in humanity’s capacity to actually do good (even when we often only highlight our harm) I make a point to honor the spirit of the day. 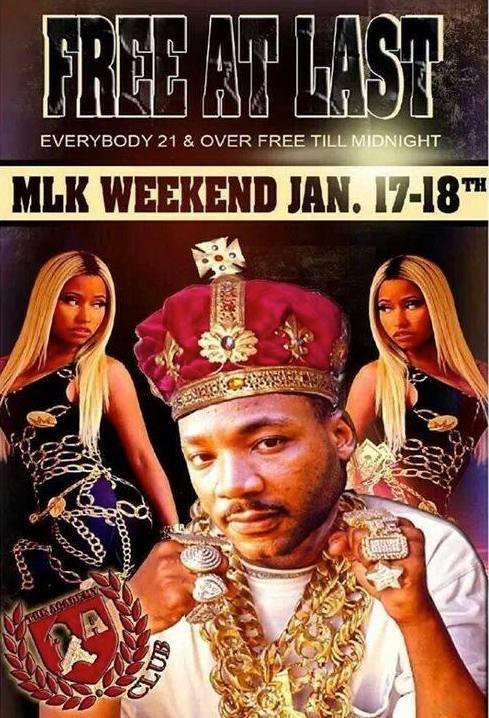 Needless to say I was incredibly shocked to see how others “celebrate” the memory of Dr. King. Social media is usually the way I keep a pulse on what is happening in the world of pop culture. I’m the first to admit that I’m a little slow on the uptake now that I don’t work exclusively with teens. I don’t often know the newest pop song, the best reality T.V. show, or which movie star is the “it” person on the scene. I’ll periodically peruse Facebook or Twitter to see what folks are talking about and considering the circles in which I travel in the social media landscape, the focus is almost always social justice issues. Shock and outrage is volleyed back and forth amongst my friends and acquaintances and it’s inevitable that at some point I’m going to be presented with an article, photo, or tangible example of how my social justice prevention work is not only relevant but also greatly needed. 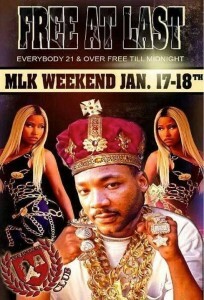 Today, I was beyond appalled when I saw a Facebook post about the recent MLK club promotion party flyers. Graphic artist have taken the picture of Dr. King and imposed him in scenarios concurrent with hip hop culture’s club scene. The Huffington Post printed an article on the apology of one graphic artist in the Miami area. The resourceful individual that I am, I searched the internet to see if this is an isolated incident and quickly found flyer after flyer of Dr. King throwing “deuces”, “making it rain”, and any other popular image in the mainstream hip hop community. At this point I’ve calmed down some and don’t feel particularly inclined for a rant. What I’m left with are the questions, “Is this the dream?”. Is this the fruit of Dr. King’s labor from his work around civil rights, economic justice, and equality? Are his “children” he hoped would not be judged by the color of their skin but the content of their character so removed from his work they can’t see how incredibly offensive it is to use his image in such a way? I don’t know the answers to these questions, but once again I realize that we haven’t quite gotten to the mountain top. When we talk about social justice being at the root of prevention work we need to remember situations such as these. After all, we are only as sick as our secrets.